Hello and Happy Sunday to you! Can you believe that it is almost Valentine's day? This year is sure flying by, isn't it? It's time for another fun challenge over at the Paper Players! 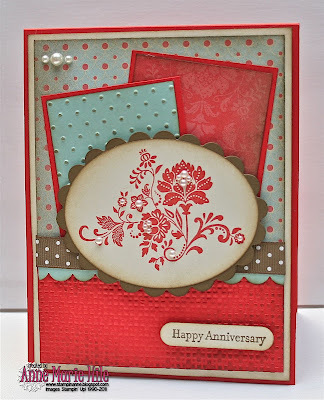 I featured the Fresh Vintage stamp set and the Everyday Enchantment DSP from the Stampin' Up! Sale-A-Bration catalog on this card. If you would like more info about the Sale-A-Bration promo, jplease contact me! 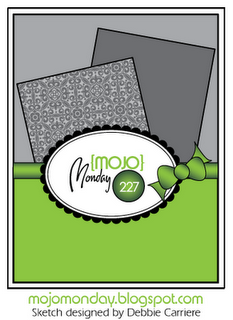 (...or check out my sidebar to view the catalog.) I distressed all of the layers with Soft Suede sponged ink, for a slightly "dirty" look. I'm still trying to get into the groove of "shabby-chic-ness". A complete supply list is available at the end of this post, if you are interested. Thanks for stopping by today! Please pop by and visit the rest of the PP Design Team (along with the Mojo Monday challenge) to view some fantastic creative inspiration. I hope you have a chance to join us at the Paper Players, this week. The challenge ends Friday, February 17th at Noon (PST). 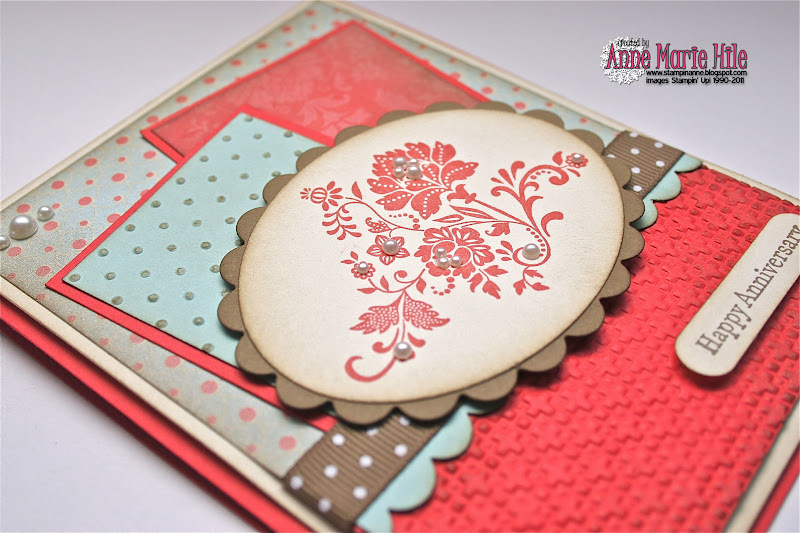 Stunning card, Anne! Great colours. Anne Marie, this is so beautiful! I think you are doing a wonderful job capturing the shabby chic look...no further instructions needed! 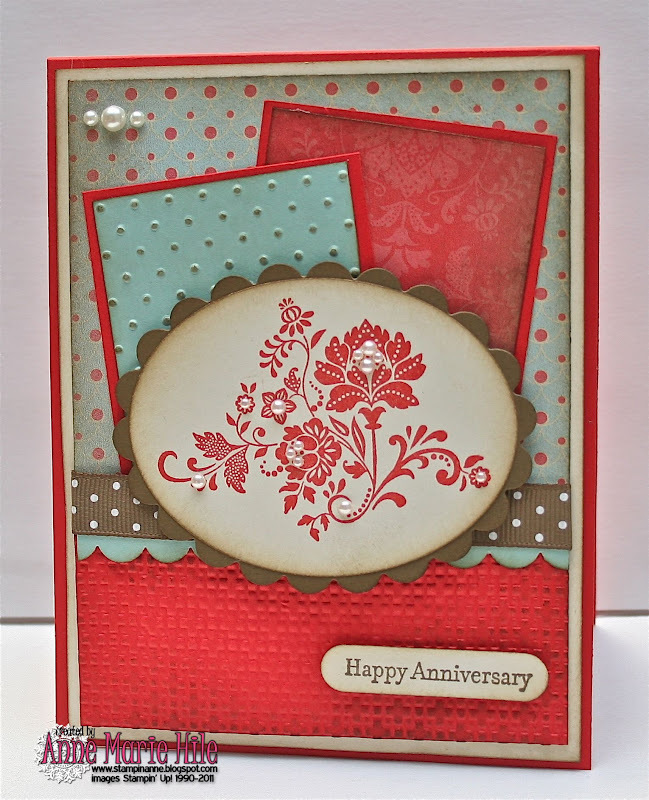 This is my favorite set from SAB, probably EVER, and it is just lovely framed with your beautiful scalloped layer and accented with the pearls, embossing and shading! Gorgeous! Ann Marie I agree with LeAnne, your shabby chic looks fantastic. Love these colors and you put them together lovely with the DSP and textured cs. Beautiful. Hugs. As ever, your have created a beautiful card and finished it to perfection. I love that color combo! Very cute card & I agree... I love the Mojo sketch this week!! Great job making the colors work. Very pretty. Beautiful, Anne Marie! I am loving all of that pearl action who have going on! Beautiful card! Love the pearls on the main image! I think as long as it has layers, you would love just about any challenge! hehehe! You are so good at this and inspire those of us who are less layered to go a step further! Beautiful colors, design, and card! So pretty. What a great card, love the colors and the vintage feel. Wow!! Love the shabby chic look!! Complete success!!! The sponging and pearls really completed this look perfectly!!! Fantastic job my lady!!! Amy L.
If the sketch has layers, I can see why u are drawn to it! Love that main image with the pearls! Beautiful card AM! Love the sponging and the embossing, you have created a wonderful card with that sketch! This is a STUNNING card! I LOVE these colors, and yeah, I don't know what it is about Mojo sketches, but they are awesome :) Fabulous texture, and I love the vintage look!